Green buildings are a tough task to tackle but Chicago has certainly done an incredible job in building and renovating green buildings. The number of green buildings is increasing all over the world, and it is exciting to say that Chicago was the first city in the entire world to have a building become LEED certified: the Chicago Federal Building (FBI building). 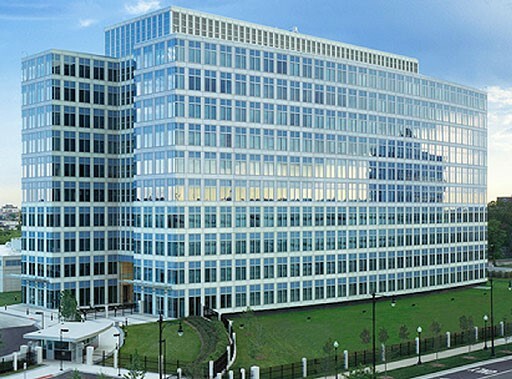 The Chicago Federal Building underwent a total renovation by implementing green features such as plumbing fixture efficiency, sustainable purchasing, energy efficient performance of HVAC and electrical systems, solid waste management, and green cleaning policies (Chicago 2008). Plumbing fixture efficiency reduces the burdens on potable water supply and wastewater systems. This means that water use is reduced. A great way to reduce water use in buildings is to have motion sensors for water in bathrooms, for example. That way, there is never water constantly running because someone forgot to turn it off. Sustainable purchasing could be purchasing 100 percent recycled paper in bathrooms. Another example would be a paper shredder to shred paper and reduce the amount of waste that goes in landfills. Green buildings practice both small and large ways of sustainability; large ways may be using solar panels to generate electricity and a small way may be purchasing 100 percent recycled paper. It takes both large and small contributions to affect the overall contribution of a green building. The FBI building took a financial risk but in the long haul it not only economically benefited them but it environmentally benefited the earth. It is not easy becoming a LEED certified building. There are very strict rules and regulations in order to become certified. One of the rules is that the building must share its water and energy usage data (LEED Program Requirements 2011). This is important because it holds credibility to the building. It does not allow buildings simply to say they use small amounts of energy and water but insists that they use small amounts of energy and water. There are ten different categories that are taken into account when evaluating a building wanting to become LEED certified. 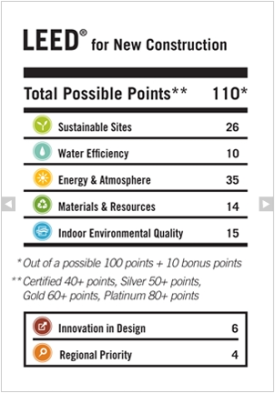 These categories include: sustainable sites, water efficiency, energy and atmosphere, materials and resources, indoor environmental air quality, photo source, locations and linkages, awareness and education, regional priority, and innovation in design (Well Home 2011). It is imperative that these rules and regulations remain very strict otherwise there would be no credibility to LEED certified buildings. Some elements of green buildings include indoor air quality, energy, materials, and waste. Indoor air quality can be achieved by using non-pollutant materials, managing the moisture and humidity, and ventilating effectively. To achieve energy efficiency using solar heating and using daylight help with energy efficiency. The materials used should be recycled. To reduce waste people should reduce, reuse, and recycle (Elements of Green Building 2011). Not only do these strategies help the building be sustainable but also the people working inside the building need to be on board. This means doing little things such as recycling paper, shredding paper when possible, reducing the amount of paper used, and turning off lights and using sunlight when possible; just to name a few. The Society of Environmentally Responsible Facilities (SERF) is an organization that certifies buildings as sustainable or green buildings and puts professionals through courses to be certified in evaluating and certifying buildings. SERF recognizes the obstacles that managers and owners of buildings see when it comes to transforming their buildings into green buildings such as cost, accessibility, and reasoning. SERF therefore strives to make it as accessible, low-cost, and worth it as possible for managers and owners to make the decision to transform into a green building. It is hard for owners to grasp the benefits of green buildings because of the reasoning behind green buildings. Their first response is “why should I invest money in a green building when all the buildings surrounding me are not?” That is a good question, and SERF tries to answer this question by providing facts that green buildings in the long run will save businesses money and will reduce its negative impacts on the environment. It is tough to convince owners to renovate or build green buildings, because green buildings tend to be about 3 percent higher in rent than ordinary buildings. However, green buildings can lead to economic benefits such as decreasing operating costs, insuring against future energy cost increases, decreasing greenhouse gas emissions, and saving current resources such as energy and water (Eichholtz, Kok, & Quigley 2010). When techniques are used that derive energy from a resource that is nonrenewable, then the price continues to go up and the resource supply begins to dwindle. So, when it’s gone it’s gone. This will drive up the price of energy costs from year to year, which is why it is important for owners to realize this and less consumptive ways of using energy. In conclusion, there are many benefits to constructing or renovating a building to become green or LEED certified. It takes both the construction of the building as well as the people inside it to effectively keep and maintain a green building. At the moment, it may be hard for businesses to see the immediate benefits, but in the long run the results are worth waiting for. Moving forward there needs to be more education for business owners on green buildings so that they will recognize the long term benefits and will be more likely to construct or renovate a green building.